With Halloween being a week away, it is only natural to want to be scared. Watching scary TV shows and horror movies is what Halloween time is all about! What if this trend of being scared continued you to your school? SUNY was first established in 1816 at Potsdam, NY, but it was in February 1948 when it became a state university system. While SUNY is still relatively young, it has managed to accrue a few ghost tales in those years. 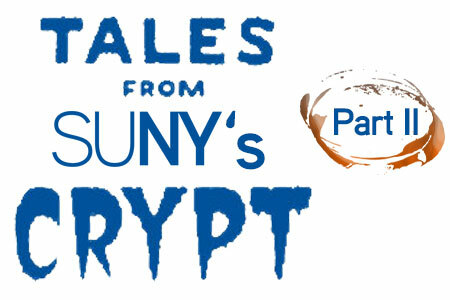 Last year, we brought you some information about haunted tales at SUNY campuses. Read on for a few additional and updated tales of supernatural happenings that have put these locations on the spooky list. SUNY Cortland: Each year at Clark Dorm Building, room 716 holds a significant presence. It is there that the ghost of a football player who is still wearing his uniform has been seen. 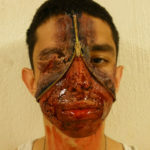 People have said that this football player has a cut around his eye and does not stop bleeding. Often, the football player likes to roam the hallways and sit outside of the windowsill. Nobody knows why he is there, and nobody knows why he has not left. If you enter Brockway Hall, proceed with caution. Students have told the University that they have seen the ghost of a cook haunt the hallways. This hall was said to be one of the oldest dining halls on campus, and that may be the reason this cook does not want to leave. An investigation even ensued, resulting in no further find of this ghost. One of the oldest buildings on campus, Cheney Hall, is home to a ghost of a former female student whose untimely death was remarked with a mural. This mural has been giving students uneasy feelings ever since. SUNY Plattsburgh: Home to MacDonough Hall, the famous ghost filled location that students love to talk about. MacDonough Hall was used as a morgue across from an old hospital, and owned by a wealthy family. After a killing occurred in this building, students swear they hear screaming and strange noises often around night time. A SUNY Plattsburgh alumnus who once lived in the hall, stated that the fire alarm would go off at 3:30 am, 13 times throughout the semester, to be exact. 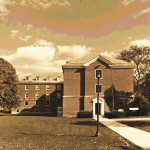 SUNY Brockport: Two Halls haunt this SUNY college; Hartwell Hall and Mortimer Hall. The cleaning staff has claimed to hear doors opening and closing, strange noises, and people in the halls when nobody is actually there. Hartwell Hall is one of the oldest buildings on campus, which could easily explain its haunted hallways. Students even created a video to prove these strange occurrences. Mortimer Hall was the victim of a suicide. Students claim to have personal items disappear, and randomly appear at later times in different locations. One female student stated she woke up to a bright light above her head in the middle of the night, stayed for a few seconds, and than disappeared. Investigations were done, and did show random lights turning on and off in the middle of the night, with nobody around to do so. SUNY Geneseo: As the story goes, a spirit named Tommy haunts room CD21, in Erie Hall. While much else is unclear about the ghost, there has been enough encounters for SyFy Network to prompt the making of the film “Please Talk With Me”, based on the true encounters of the spirit. That film premiered at SCARE-A-CUSE in 2012. University at Albany: There are three places assumed to be haunted at this University; the Humanities Building, The Performing Arts Center, and Mohican Hall. People claim to hear weird and strange noises in all three places, strange noises not done by the living. 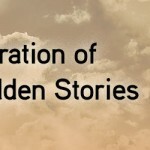 A student decided to see if these stories were true, here are his encounters. Other Universities also have things sure to send chills down a students spine. Such as the Eerie Cemetery on SUNY Purchase College grounds, or Dutchess Community College, which was built on an old hospital ground. Whatever the case may be, students beware…you may not be alone out there.